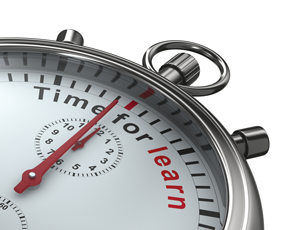 A move toward a learning model will increase the retention of knowledge in your training program. Stop training ­— it doesn’t work. 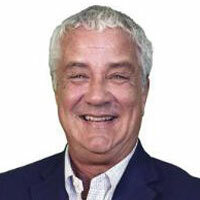 I have been in the learning and development field for more than 17 years and if I have learned one thing — it is this: STOP Training! Before you write me off and turn the page, let me explain. Training can be defined as the action of teaching a person a skill or type of behavior. Learning, however, can be defined as the acquisition of knowledge or skills through experience, study, or by being taught which results in a change in behavior. Why do I say STOP Training? Because, in the traditional sense, it does not work. An example of traditional training could be described as a PowerPoint with a trainer at the front of the room — perhaps a little interaction. Perhaps no PowerPoint at all. Perhaps a lecture. More passive than participatory. Perhaps strong coffee and stale donuts. day; 35 percent retention after one week; 10 percent retention after six months. We have all done it. We have all sat through it. I am talking about the PPT lecture. Cartoon slides, multiply fonts, and lecture simple do not appeal to today’s learner. Worse yet, the modis operanti, seems to be to cram as much information as possible into as short a period of time as possible. Twenty talking points taught in 55 minutes. If we can agree that traditional training does not work as it has been defined here, then can we agree that we need to change? 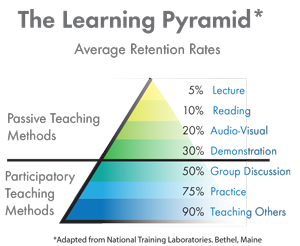 Here is a low cost, no cost, list of four things you can do today to change the retention goal of your training; to move toward a learning model. 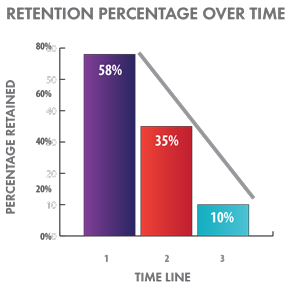 Retention can be measured in several ways. One is to measure pre- and post-learning. Simply put — an assessment (test) given before the class and then after the class. The goal is not an individual scored — the goal is the percentage of change between the pre- and post-assessment. 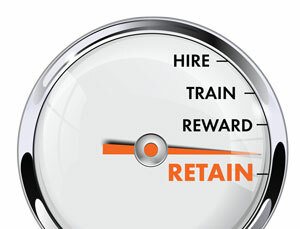 Another method to measure retention is to complete an On the Job Checklist (OJT) several weeks after the training. The question is what was taught in the classroom being applied in the workplace? Again, the score becomes more meaningful when compared to previous behavior: after training, was there a measurable increase in the OJT application? Metrics matter. Adults need repetition to retain information. In any training session, to increase learning which results in a change of behavior — the facilitator must tell them what you will tell them, tell them, and then tell them what you just told them. Repetition is the key to learning for adults. In line with the repetition point above, to increase learning, all training should incorporate planned post classroom activities. STOP Training — it doesn’t work! Learning works. With a focus on metrics and measuring a change in behavior — real learning can occur. With this in mind, I think I will change my title from Vice President of Training to Vice President of Learning. Millennials place a great value on in-house training and anything that will advance their careers.